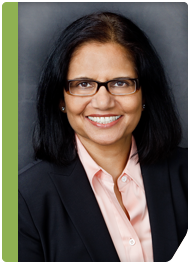 Poplar Healthcare » Anita S. Kulharya, Ph.D.
Dr. Kulharya comes to OncoMetrix from Georgia Health Sciences University in Augusta, GA where she directed the Cytogenetics laboratory for 16 years. She received her PhD in Biology from University of North Texas and post-doctoral training at UT Southwestern Medical Center at Dallas and Texas Departmental of Mental Health and Mental Retardation. After finishing her training, Dr. Kulharya directed a private lab in Florida before moving to Augusta where she held joint appointments as a Professor in Department of Pediatrics and Pathology. She was involved in teaching of medical students, residents, and fellows, and collaborated on several research projects. Dr. Kulharya has several publications in neoplastic and constitutional chromosome disorders. She holds memberships in ASHG, ECA, SERGG and is a founding fellow of the American College of Medical Genetics.